So you have been a student tweeter and you have grasped the basics, it's now time to graduate and move onwards and upwards. There are a few more advanced skills that you may need now that you are a graduate tweeter. In this section we look to master finding, sharing and delivering value from twitter. Whilst you have been getting to know Twitter it's been getting to know you too! Twitter helps you to find content that is relevant to you … it's very clever like that … we don't always need to scroll through the millions of daily tweets! 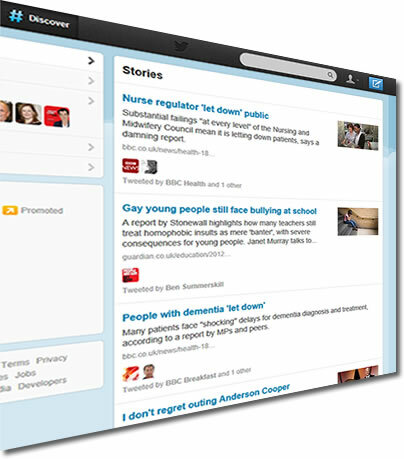 Within this search for "dementia" (picture to the right) Twitter has demonstrated the richness of content it delivers. These tweets are a mixture of those seeking and giving advice and show two of the main values to be gained from Twitter as a tweeting nurse. We get a good understanding of what advice is needed and by whom, in these four tweets we see a relative and a professional seeking advice, one around funding and the other supporting work for those working with people with dementia. The other two tweets are offering information, both via posting links to content that offers further exploration. As a tweeting Health Care Professional (HCP) you'll be looking to improve your knowledge and to increase your ability to offer excellent healthcare. By seeing both sides of the help/advice conversation you can both improve your knowledge, connect with people to expand your knowledge and then use this new knowledge to support those seeking advice both on Twitter and in your working like. Search for people – Search for people you know in the real world or even those you want to know! Search for organisations – Search for the organisations you are part of or the organisations you are interested in, many have Twitter accounts now and are using the really well. Search for content - use keywords to find content. Search for hashtags - hastags are used to group types of conversations together in a chat, from an event or around a short/longterm topic. You have been pretty busy getting to know Twitter, you are connected to people from all around the world and you are helping each other by sharing knowledge, well guess what Twitter has got to know you pretty well too. "Discover" is breakdown of current information being shared by people you follow and that follow you, this makes the content super relevant to you and you alone. In essence it's like your own newspaper designed especially for you; in fact you'll probably never have to buy another newspaper again. The beauty of "Discover" is it avoids you having to be on Twitter all the time to digest what other people find interesting. Twitter will tell you when you have been mentioned or followed or re-tweeted, so Twitter needn't take up a lot of time. "Discover" is a great way to dip in and out of Twitter and find information relevant to you. Now you have been around the Twitter block and seen some of the weird and wonderful hashtags that crop up we thought that two minutes explaining hashtags would be worthwhile. A hashtag or # is a flag used to group tweets or conversations together. EG #EBP groups tweets around evidence based practice and people use it to search and share healthcare evidence. 1. 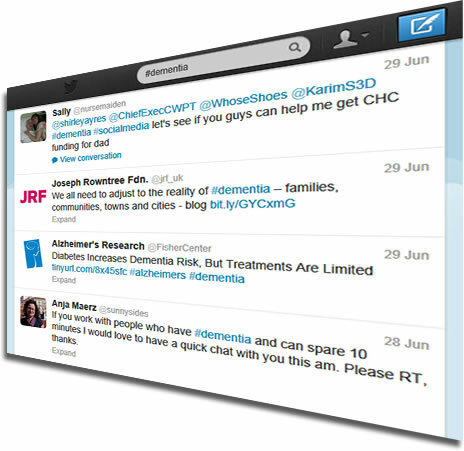 HashTags as helper - In our earlier example we searched for "#dementia", this allowed us to pull in all the recent conversations that other tweeters had hashtagged, nicely combining the relevant tweets for us. 2. Event HashTags – Event hashtags allow people who are not there to get a feel for the content that is deemed most relevant by its delegates. Follow an event live, or look back to discover what happened at an event you missed (remember tweets don't hang around for long, so don't delay). If you running an event it’s a good idea to publish a short and appropriate hashtag in advance so people can start tweeting before they get there. 3. Twitter chats powered by HashTags - Twitter chats are a fundamental part of driving the connectivity of HCPs across Twitter and these are powered by hashtags. By searching and using the Twitterchat hashtag you can read and join in the conversation. Click here to view a full calendar of when these chats are taking place. It’s a good idea to follow the people who organise the chats as they often send out regular tweets giving details of the time and subject of their chats. The best way we have found to join in a Twitter chat is to use our CHAT NOW page. For a full guide on how to use this page CLICK HERE. 1. Give it a try – have a play around on Twitter you cant break it ! If you get lost simply click the home button to return to your main screen. Click all the buttons and highlighted text and see what they do. 2. Search for hashtags # appearing on the TV – its gives you great confidence and a real insight into how hashtags # work. 3. Read a Twitter chat - Read through a previous Twitter chat transcript before chatting for the first time to get a flavour for how they run. 4. Lurk – Log in on a Twitter chat and lurk. Spend some time watching how it works, learning and gaining confidence. 5. Warn your followers – Before you participate in a chat send out a tweet letting your followers know that you are taking part in a chat, then they know either to ignore your tweets or join in. 6. Take the plunge – When someone tweets something you agree or disagree with during a chat jump in and reply. 7. Everyone adds value – it doesn't matter if you are a student or a chief executive everyone has a valid opinion and point of view that will add value to the conversation. The great thing about Twitter is that diverse HCPs with varying experiences get to chat to each other. 8. Tweet chats are public – remember that you are in a public space when participating in a Twitter chat, its still as if you are in a room full of people. Remember HCP offline = HCP online and professionalism still applies. 9. Fast and furious – some chats can be very fast and you may find it tricky to read all of the tweets coming through. Don't panic you don't have to read all of them just stick to the people you find interesting you can always re read the conversation later. 10. Share, share, share – if you have found a good Twitter chat share it online and offline. If you have found value in it the chances are another HCP will too. Have you benefited from these guides? Would you like us to take your colleagues through WeNurChat's Twitterversity as a workshop? Find out more here.